This is a guide for tour operators, eco-lodge managers, wildlife park staff, students and others interested in a career in wildlife tourism or in adding a wildlife component to their tourism businesses. The emphasis and most examples are Australian, but the principles are relevant to all countries. 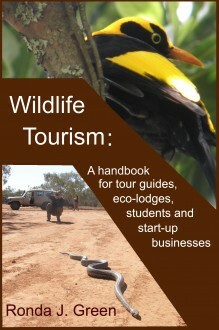 The book is packed with information on skill-sets of tour guides,learning about wildlife, finding and observing wildlife, interpreting wildlife, interacting with tourists and colleagues, conservation issues and some of the financial and legal aspects of setting up your own business. Many references to other books, articles and websites are included. Introducing people to wildlife and helping them appreciate their beauty, understand something of their ecology and behaviour, get curious about things we don’t yet understand, and realise some of the conservation thetas currently facing them, has been a lifelong passion. It is one of the major reasons I sarted our wildlife tourism business. Coming more from an academic background than a business one (although I did run a holiday farm focussing on nature studies and horsemanship many years earlier), the business of starting and running a small business took me and my family into a very steep learning curve. I knew little of the red tape involved, how much time and money was needed for advertising (or how to reduce some of that), or about book-keeping, insurance, or working with booking agents. One of the aims of the book is to help others who may be in the same boat, starting out with loads of enthusiasm for wildlife and sharing their enthusiasm with others, but lacking experience in running a business venture. Others come from the other direction – they’ve been running a tourism or related business but have an interest in wildlife and want to brush up their knowledge, so there are chapters devoted to getting a grasp of the basics and leads to finding more of the sort of information you’ll need to run good tours in your locality, as well as guidelines or interpreting this to your guests. For students and job-seekers there are guidelines on what will appeal to your prospective employers, and most of the book will be very relevant for any who seriously want to work in this field. Most of the examples are Australian, but there is ample general advice to be applicable anywhere in the world. The big picture: does wildlife tourism matter for our economy or for conservation? Why should you understand ecology? Population ecology: why populations of animals of a particular species increase, decrease, stay the same or never enter a particular area. How much disturbance can animals tolerate without changing their behaviour, avoiding you or even disappearing from the region? How should we approach wildlife? What happens to the wildlife you never see? Clarifying your goals: what would you most like them to remember and talk about? Testing: what best holds their interest and stays in their memories? Thinking creatively: it’s fun and often productive! Is it possible to get a hard copy of your book here in Australia as I see your books are sold in the UK? I’ll be able to let you know a price soon. Pl let me know whether the printed version of this book is available. If so, please let me know the price and how to buy, especially the availability in ACT. You can now purchase a copy vi the WTA ‘shop’ page under the ‘Resources’ menu, but I’m now almost out of copies.